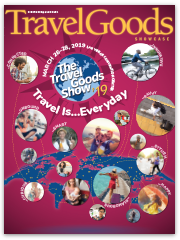 This is your chance to advertise in Travel Goods Showcase, the industry’s award-winning trade magazine, and get double your money’s worth. For a very limited time, book a full-page ad placement for the normal half-page ad price. That’s right – half-page pricing nets you a full page in front of the largest audience of travel goods professionals. But you have to act fast: Space must be reserved by August 7, 2017, and materials are due August 14, 2017. Contact Cathy Trecartin, cttga@aol.com, 877-842-1938, x-702. The International Travel Goods Show is big – which makes location more important than ever, so you’ll stand out from the crowd. Spots are allocated on a first-come, first-served basis, so there’s every reason to book now while you still have booth spaces to choose from. This is the biggest trade show for travel products so it goes without saying that you need to be present. Don’t wait – contact Cathy Hays, chaystga@aol.com, 877-842-1938, x-707, and stake your claim at the industry’s most important pop-up storefront. There are plenty of reasons to join the Travel Goods Association: We’re your industry lobbyists in Washington, D.C. and your media liaison the world over; plus we offer our members discount shipping and credit card processing, Travel Goods Showcase, the industry’s biggest and best news source, and much more. Right now, you can join TGA for the remainder of 2017 and receive 100% of these benefits for just 50% of the normal rate. This is the best time to join, and discover all TGA can do for you. Contact Member Services Director Cathy Trecartin for details, cttga@aol.com, 877-842-1938, x-702. As of July 1, thanks to a five-year-long effort by TGA and others, President Trump proclaimed that U.S. travel goods imports from all GSP-eligible countries (see page 12), including the Philippines, Thailand, India, Pakistan, Cambodia, and Sri Lanka (but NOT China or Vietnam), are now duty-free under the U.S. Generalized System of Preferences (GSP) program. Please contact TGA’s Nate Herman at 202-853-9351 or nate@travel-goods.org, if you have questions or would like additional information. There has been a lot of talk in the news lately that the House Republican proposal to include a “border adjustment tax” (BAT) as part of any tax reform effort is dead. Earlier this month, House Ways & Means Committee Chairman Kevin Bray (R-TX) proposed phasing-in a border adjustment tax (BAT) over five years, instead of immediate implementation as proposed in the House Republican “A Better Way” tax reform proposal. Thankfully, Brady’s phase-in approach failed to gain new support for the proposal. However, it appears opposition to the TGA-opposed BAT proposal continues to grow. Regrettably, key Congressional leaders continue to keep the concept of the BAT alive. Why? Because Congressional Republicans, and the White House, want any tax reform they approve to be permanent, like the Ronald Reagan tax reform of 1986, not temporary, like the Bush tax cuts in the 1990s. In order to make tax reform permanent, Congress must find a way to pay for it. Lowering the corporate tax rate from 35 percent to 15 or 20 percent, as both the White House and Congressional Republicans have proposed, means over a trillion dollars in lost revenue for the U.S. government over the next decade. Eliminating key exemptions, as proposed by the White House, will only recoup a portion of this lost revenue. However, the BAT, as currently envisioned, would raise over $1.2 trillion in revenue for the U.S. government over the next ten years. That revenue is really hard to give up if you want to make 15 or 20 percent corporate tax rates the new norm, which is why BAT is not dead yet. Continue to voice your opposition in meetings with Members of Congress, and share our handout showing the potential impact on our industry. For more information, please contact Nate Herman, TGA’s Director of Government Relations, at 202-853-9351, nate@travel-goods.org. What steps are you taking to enhance your company’s profile via social media? Expand your social reach by sharing company news and product developments with TGA via press releases on company letterhead, and we’ll spread your updates via our Facebook, Twitter and LinkedIn pages. Contact Kate Ryan, kate@kateryanpr.com, 774-929-5223, and let TGA boost your social profile. New “60-day” notices have been issued alleging that brands and retailers sold accessory bags, sports cases, and cosmetic bags in California that contained di (2-ethylhexyl) phthalate (DEHP) in violation of a California law known as Proposition 65 (Prop 65). The notices serve as intent to bring lawsuits against the recipients that sold these products. For more information on Prop 65, please go to the Prop 65 page on the TGA website or contact TGA’s Nate Herman, nate@travel-goods.org, 202-853-9351. Last week, House Ways & Means Committee Chairman Kevin Bray (R-TX) proposed phasing-in a border adjustment tax (BAT) over five years, instead of immediately as proposed in the House Republican “A Better Way” tax reform proposal. Brady’s phase-in approach has failed to gain new support for the proposal. Instead, it appears opposition to the TGA-opposed BAT proposal continues to grow. Regrettably, ongoing support by key Congressional leaders means the BAT is not yet dead. TGA needs you to contact your members of Congress to oppose the BAT. This link makes it easy for you and your colleagues to send emails opposing the BAT to your Representative and Senators in only a few minutes. Contact your Members of Congress today. 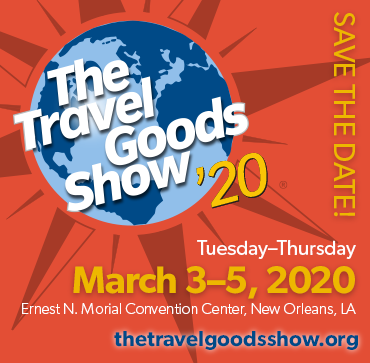 This year’s International Travel Goods Show fell a month later than our usual early March schedule – timing that prevented many long-time Show exhibitors and TGA supporters from participating in this year’s Early Bird discount program. Recognizing this, and in the spirit of fairness, TGA’s Board of Directors just voted to extend the Early Bird discount deadline for The 2018 Show to July 1. If you haven’t signed up for next year’s Show, this is your chance. This is the only exhibitor discount program available for The Show, and this is a one-time extension only. Deposits must be received by July 1, 2017. Contact Cathy Hays, chaystga@aol.com, 877-842-1938, x-707 to save now, before this special opportunity is gone.